Want to introduce exciting and fun virtual team building activities to your remote team? Or looking for a way to celebrate your success with your virtual business clients located in various locations around the world? If you feel you don’t have time to organize it, then hire a virtual assistant to take care of the details for you! Here’s how you can put your virtual office “happy hour” together. #1 Schedule a time and book your online conferencing room for the “happy hour”. Take into consideration that people will be in different time zones. Do your research first to make sure you host your online happy hour at a suitable time. For one hour arrange for your virtual team to take “time out”. “Turn off” your systems and give your remote team permission to have fun and celebrate! #2 Arrange a gift basket or hamper (in advance) for each of your virtual team or clients. Send the hamper along with an invitation to join you for the virtual team “happy hour”. There are hundreds of ideas to choose from. Food or Wine hampers are a great idea for this kind of occasion! Depending on your team structure and the size of your team select a gift that suits your budget and virtual office culture. When selecting suitable gifts, keep in mind the culture of individuals located in different parts of the world. #3 Prepare a motivating photo or video presentation highlighting the event or project you want to celebrate. Use moving music and quotes to inspire the team. Animoto is a great online tool you can use to create inspiring videos very quickly. 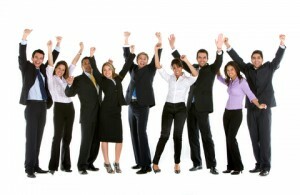 Make sure you include photos of the individuals participating in your virtual team “happy hour” celebration. Everybody will be eagerly watching, waiting for their face to appear in the video presentation. #4 Prepare some fun team online award certificates to present to individuals. These can be presented “virtually” then sent to individuals online by posting the award on social media platforms. Get creative with your award categories. They can be humorous or genuine awards depending on how you want to style your virtual celebration event. #5 Play an online virtual team building game. We recommend these online virtual team games as a fun way to bring your virtual team together. Check out these virtual team building games. They are brilliant! Totally online, self-facilitated games you can play with your remote team. Just because you’re not all co-located in one office doesn’t mean you can’t celebrate your successes. It’s all about being thoughtful of your virtual team needs! It’s all about hosting virtual team building activities that inspire your team to be creative and actually work and win together! Have fun celebrating!